'Winfield Hall', the Frank W. Woolworth estate designed by C.P.H. Gilbert c. 1916 in Glen Cove caught fire today under unknown circumstances. Click HERE for the CBS News story on the fire. Photo from HERE. Just tragic ... millions in damage and will those fixes ever be made. I would be this leads to the wrecking ball. Also wouldn't be surprised if this was some type of insurance fraud. This will only accelerate deterioration by neglect when the exterior isn't resealed. How wrong CBS got it when they stated that the house was "restored" in 2010. It has been an ongoing tragedy to watch the house deteriorate over the last 15 or so years, and the grounds descend into trash strewn wilderness. Even if funds to restore the house are available- and my guess is they are not, the current owner's aesthetic sense as evidenced by the ramshackle condition of his properties, fills me with dread about what the future will hold. Winfield is a landmarked property, so my guess is that an outright "tear down" is not in the cards. But I imagine a very bleak future for a house, that while no favorite of mine, is deserving of a far better fate. Unfortunately the magnificent interiors, created by countless craftsman and artisans, which are also some of the most elaborate room settings remaining on Long Island from the height of the Gold Coast era are simply irreplaceable. Under the ownership of the inept and delusional Martin Carey I am sure whatever insurance money will be gotten will be used for anything but a proper restoration and the entire estate and mansion itself will continue to deteriorate. News12 said that only a few rooms were damaged, though I agree that this may be the beginning of the end for Winfield. It appears the fire was contained to rooms in the former service wing, (west half of the structure) however that wing also includes the Billiard Room, which was being used as a bedroom and where the fire started. The dining room also appears to be damaged as well as a large number of very ornate bedrooms on the second floor. What did not burn was heavily damaged by smoke and water and with temperatures this morning below 10 degrees on Long Island, damage continues to occur even as we speak. A tragic and unnecessary fate. I do not look forward to hearing about what the owners "plans" are moving forward. Is Carey's Seaview Terrace in Newport next? Funny. The first words that spring to my mind isnt 'suspicious', but 'inevitable'. The trajectory of the property under its current owner long ago sealed its fate, and though we won't know until the fire inspector has done his job, it seems far more likely that carelessness, neglect, aging systems and old construction are the perfect storm that caused this. Though I'm on record as no particular fan of the exterior architecture, and won't pretend otherwise, the house is nonetheless a potent symbol of time, place, and aspirations, and perhaps even a metaphor for the American dream gone astray. These stories so rarely have a happy ending, and it would seem the fate from here is a given. Very sad. Having shot many commercials in this house, it looks like the fire was in the dining room - office - hovel - room used by the Careys, and I would not be at all surprised if it was space heaters that started it. I wouldn't be surprised if they were sleeping in there! The only benefit of their mismanagement was that I got to work there a lot on film crews and was able to see such an amazing, decrepit pile first hand. The upstairs rooms above the fire were already so beat up, but made great sets for glamorous decay, same with the gardens and terraces, and the staircase, nothing could beat it. As D.E.D. says, it's very, very sad to see something like this so damaged. Fire inspectors have said today the cause of the fire was electrical. Obviously out dated utilities with no improvements to the physical structure over decades was a contributor to the fire. As animal abusers are denied the ownership of any animals, the Carey's should be denied ownership of real estate. Their collection of crumbling, decaying mansions is a disgrace. Have the Carey's ever gone on record about their intentions for this house? Are they lucid and believable? Hard to imagine why you would purchase an estate like this and then just let it deteriorate. Have they ever tried to sell it? BillinMI- I don't believe that anyone who chooses to live as the Carey's have done- no running water at times just for starters- would be judged as "sane" by normal standards. To this as strong dose of delusion is also clearly present: several years ago, they turned down a Bona fide offer of $16 million for the place from a plastic surgeon who wanted to use it as a rest-rehab center for patients. The local real estate community was agog at Carey's unbelievable stroke of good fortune- and the neighbors begged him to accept and even appealed to his daughter hoping that she could talk sense through his gentle madness. She not only declined, but reiterated his assertion that the place was worth not a penny less than $25 Million. I think that you would have a hard time even giving it away at this point. Even pre-catastrophe. And anon 4:08- I believe that poor Carey is very much like those animal hoarders you see on reality tv (not that I ever watch those shows or anything): they "love" the animals, but are clearly incapable and overwhelmed, and utterly blind to the abuse that results. It's hard not to want to haul of and slap some sense into them, although I'm not sure that this is accepted psychiatric treatment. Nowadays anyway. Magnuspetrie, I volunteer to use the old fashioned slap some sense approach for this insane family. In retrospect the fire may be a blessing. Now many sane people, insurance adjusters, contractors, code inspectors will be dictating the repairs so maybe someone, somehow will actually do some good for the building. God knows the Carey ownership has been a curse. While everyone seems to be pointing to gloom and doom, let's point out a few positives. It appears that the most important and irreplaceable rooms, the grand staircase hall and ballroom/music room, survived. The roof is intact and the structural damage appears minimal. Some rooms have been partially damaged but not destroyed. 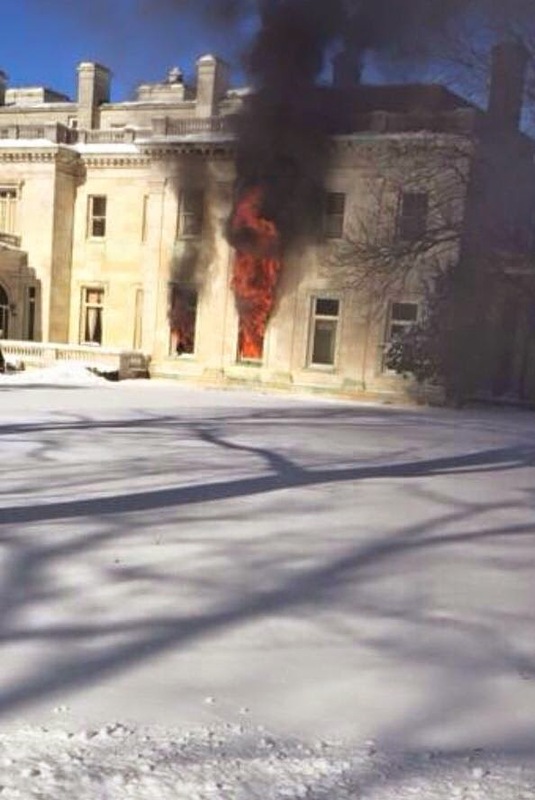 This puts Winfield in a much better position than Idle Hour after a fire wrecked that mansion's most important interiors (remember - that house did survive). Winfield's billiard room appears to be a total loss, and some of the bedrooms may be gone. The dining room is a question mark. Using faux materials (faux-finish marble instead of the real thing, wood grained molded plaster instead of carved wood and gold metallic paint instead of 22 carat gold leaf) a visual approximation to the original details could be achieved at relatively modest cost. The billiard room might have to be replaced with something less elaborate - hopefully keeping with the style of the mansion. With regards to the alleged restoration: perhaps the work done on the house in 2010 had to do with movies that were shot there (could the film studios have paid for repairs and interior polishing to make the mansion appear august on film?). The house indeed looked awfully good in Pan Am and Mildred Pierce (In Mildred Pierce the house starts out as a decaying mansion that is later restored to its former glory; in Pan Am it became a glittering hotel on the French Riviera). Perhaps the promise of more film income will spur a halfway decent restoration - maybe with the help of Hollywood money. Anon 10:39- I believe you are correct about how Carey came to own Winfield. But the area is residentially zoned at this point, and my guess is that any high traffic redeployment- hotel, catering hall or the like would not pass muster with the neighbors and the planning board. And Titanic- I do not believe that the roof is sound- the exterior gives evidence in places of very serious water damage, and much of the exterior woodwork, like the window framing, is badly rotted. Was the place properly insured? Does Carey have a fortune that he can or will suddenly unleash to save the house? I don't think that anyone who has watched the fate of any house that he has been involved with would answer "yes" to those questions. For "newbies" to this estate, here is a full dossier of pictures, out and in. And, obviously, before the fire. When Winfield Hall has been open to visitors a quick viewing would make you think the interiors and structure were in great condition, however when you look closely, you spot deteriorated plaster everywhere including the ceilings in the first floor rooms. The music room while glittering and eye catching has deteriorated woodwork, moldings and window frames that don't close, hopelessly warped by water infiltration. The second floor has a few rooms in dire need of significant repairs. Wood rot, holes in both floors and ceilings and plaster ornamentation that is nothing more than flaking dust. The third floor has ceilings near collapse. The post by the photographer who has utilized the ruined second floor for photoshoots attests that nothing has changed much. This weeks smoke damage and tons of water will certainly not be a positive even to the rooms that were not damaged by flames. Most if not all of the deterioration could have been eliminated years ago by simply repairing the leaking roof, but the deferred maintenance has been ongoing since the 70's and yes the failed luxury gambling facility was indeed how Carey acquired the mansion. I am sure the movie and ad productions provided some funds to do repairs and make the sets look good, but not to fix the underlying problems. One news source said a couple of hundred thousand in restoration was done in 2010. That kind of money would cover repairs and expert craftsmen to make the main rooms look good for the camera, but the place needs a few million in repairs due to the Carey's lack of maintenance. At the time of their fire, Idle Hour was a fully functioning college building and they had the Fortunoff family as benefactors with deep pockets, however even there, the college did little to no restoration whatsoever. They simply repaired and rebuilt the interiors with some pleasant generic spaces. Many interiors that were smoke damaged were simply ripped out, not restored and the replacement rooms are acceptable for college use, but resemble nothing from the Vanderbilt era. Great information and links. Any further local news since the fire?